The idea behind “Daily Inspirations for Caregivers” is simple: we help family caregivers start every day well with beautifully-crafted messages that arrive by personalized email for one full year. It is a loving way to help yourself or a caregiver you know benefit from the empathy, encouragement, and support provided. • A one- to two-minute video incorporating nature photography, original music, and Jim Miller’s voice. • A two- to three-minute audio by Jim offering a single positive caregiving message, often calling upon the wisdom of experienced family caregivers, many of them well-known. • A one-page writing by Jim about one aspect of caregiving that offers advice, encouragement, and support. • A photo-thought that incorporates one of Jim’s photographs with a memorable, affirming quotation. If you’re a professional in a healthcare practice or a health-related organization, you can provide “Daily Inspirations for Caregivers” as a way of encouraging and empowering family caregivers of the ill, the injured, or the incapacitated. As you enable the more positive spirits of caregivers and consequently their care receivers, you promote healing and health all the way around, including with your own staff members. Better yet, if your organization purchases subscriptions for individual caregivers, the cost is reduced even more, depending upon the quantity you order. The cost can be as low as $5.00 each. 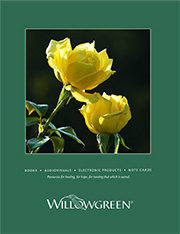 Contact Cat or Jim at 260.490.2222 to learn more or email us at orders@willowgreen.com.